Verdict: Good quality sound, Bluetooth works well, headphones feel quite tight on head and wearing them for longer becomes uncomfortable, being able to adjust tension would be helpful. Could not try them in shop. Glad I purchased these headphones! Superb product but with three small drawbacks. Verdict: "These headphones are generally excellent. Large cups with soft padding that sits over the ears onto the head make them a joy to wear for extended periods of time (6+ hours) which is easily achievable thanks to the excellent battery life. Verdict: Worked excellently for first month but now and then the sound just keeps dropping out. No pattern to when it happens. I hope I can keep using these but if I buy a new set, probably won't be this brand again. Right side broke both times. Verdict: I enjoyed the sound quality of this headset. It mostly sat in a nice velvet pouch in a drawer and was in use barely 2-3 times per month for 30 minutes or so. One day the right side of the sound was completely gone. Piece so immaculate and cared for, I couldn't understand why! Verdict: I thought it would be usual balloney, but they're amazing for what I need which is mainly streaming and playing songs whilst out walking. Would defo recommend!! Verdict: I've had these 12 months, they're comfortable, great battery and I'm really happy with the sound quality because I'm a bass from fein. If your like me, these are the best headphones on the market for bassists. Verdict: Very good product, good sound quality, I turned down bass to get most from middle range. Bass was to strong for me. Downside no option to use a lead between device and headphones, microphone is very sensitive, taking all noise from background, if you doing long calls caller might feel uncomfortable. Cons: The quality of the handfrees because I can hear her moaning at me too clearly.. Verdict: This is the 2nd pair of these headphones I've bought I just love them. Really good quality sound especially bass and pretty inexpensive. Verdict: Sounds great! Definitely noise cancelling! Verdict: Audio? SONY is the key... Beautiful minimal design combined with perfect speakers and battery. ?Design is very minimal and beautiful, Colors are eye catching. Comparatively, Sony has a very beautiful design choice. ?Audio quality is stunning, Sharp, loud and powerful. Verdict: Bought this a few weeks ago and good to workout with but not super comply to listen to music or watch tv with them laying down. Audio is excellent and the bass is great. Verdict: I was just curious and looking at headphones at target and I saw these on clearance for $70 so I just gunned it and bought them. I love them, I never thought too much bass was a problem but apparently to some people it is. These connect perfect with my phone and they are loud! Verdict: Very happy with these! They're easy and intuitive to use and connect. Good price too! Verdict: Found these head phones here for half the price as else where. Very happy with the quality! Verdict: Sony M.D.R X.B 650 B.T Pros -: > Extreme levels of Bass > Great Bluetooth range of up to 10 meters > Extended battery life of up to 30 hours with 4 hours of charging. 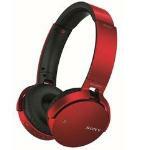 Design and Build Quality -: The Sony M.D.R X.B 650 B.T features a premium design and build quality. Verdict: These are nice headphones, price is a little bit steep, that is why they only get 4 stars. Nothing wrong with the quality of the headphones, or the sound...price on the other hand Basically ($) for a set of headphones is a little bit steep. Verdict: One of THE best sounding headphones I have used. The bass on these are incredible but not too over powering like the Sony XB950BT, which is just too much bass for me. The build quality could have been a lot better, shame on you Sony for using cheap plastic to build these.